We’d love your help. Let us know what’s wrong with this preview of 100 Tricks Every Boy Can Do by Kim Stafford. Bret and Kim Stafford, the oldest children of the poet and pacifist William Stafford, were pals. Bret was the good son, the obedient public servant, Kim the itinerant wanderer. In this family of two parent teachers, with its intermittent celebration of “talking recklessly,” there was a code of silence about hard things: “Why tell what hurts?” As childhood pleasures ebbed, Bret and Kim Stafford, the oldest children of the poet and pacifist William Stafford, were pals. Bret was the good son, the obedient public servant, Kim the itinerant wanderer. In this family of two parent teachers, with its intermittent celebration of “talking recklessly,” there was a code of silence about hard things: “Why tell what hurts?” As childhood pleasures ebbed, this reticence took its toll on Bret, unable to reveal his troubles. Against a backdrop of the 1960s — puritan in the summer of love, pacifist in the Vietnam era — Bret became a casualty of his interior war and took his life in 1988. 100 Tricks Every Boy Can Do casts spells in search of the lost brother: climbing the water tower to stand naked under the moon, cowboys and Indians with real bullets, breaking into church to play a serenade for God, struggling for love, and making bail. In this book, through a brother’s devotions, the lost saint teaches us about depression, the tender ancestry of violence, the quest for harmonious relations, and finally the trick of joy. To ask other readers questions about 100 Tricks Every Boy Can Do, please sign up. We are so lucky here in Oregon and I tend to take it for granted. One of the ways that we are lucky: so many wonderful Oregon writers. Kim Stafford is one. Even better, he teaches at one of our local colleges, Lewis & Clark. Better still, he is head of the Northwest Writing Institute and teaches workshops to adults. I hope to one day take a class from him. I heard the tail end of an interview with Stafford, who also happens to be former poet laureate William Stafford's son, on our local publ We are so lucky here in Oregon and I tend to take it for granted. One of the ways that we are lucky: so many wonderful Oregon writers. Kim Stafford is one. Even better, he teaches at one of our local colleges, Lewis & Clark. Better still, he is head of the Northwest Writing Institute and teaches workshops to adults. I hope to one day take a class from him. I heard the tail end of an interview with Stafford, who also happens to be former poet laureate William Stafford's son, on our local public radio station. During the interview, Stafford read from this memoir and it left me wanting more, to say the least. I admit to being partial to the memoir genre and the topic of Stafford's book resonated with me. 100 Tricks Every Boy Can Do is the memoir of Stafford's close-yet-distant relationship with his brother Bret, who took his own life in the late eighties. The story is organized in a series of poetic vignettes that are beautifully written and capture Stafford's own life path, as well as the emotions that are an inevitable result of the tragedy of suicide. Somehow, in its wake, Stafford manages to be humble, reflective, self-aware, loving and forgiving. And, when appropriate, he has a sense of humor as well. While many books on the topic of suicide - whether memoir, fiction or non-fiction - tend to drag one down even further or dwell too long in places where one would rather not linger, I found Stafford's book affirming, positive and honest. I believe that this book would be especially helpful for those who have lost a sibling in this way; my husband lost his brother to suicide a decade ago and I have recommended it to him. Yet, this book is universal. It is about relationships, choices, how we make our way and how we live our lives. It is rare to read a book and find yourself knowing a friend so much better than you had before. I can divide my experience of reading 100 Tricks into two parts: appreciating the book and writer, and learning about my friend. Inevitably I'll tell you about both. First, know that this is book of suicide and could be very helpful to anyone who has known someone close to end their own life. It is also the story of two brothers, growing up almost twins they were so very close and becoming very differ It is rare to read a book and find yourself knowing a friend so much better than you had before. I can divide my experience of reading 100 Tricks into two parts: appreciating the book and writer, and learning about my friend. Inevitably I'll tell you about both. First, know that this is book of suicide and could be very helpful to anyone who has known someone close to end their own life. It is also the story of two brothers, growing up almost twins they were so very close and becoming very different men. Finally, it is the story of anyone growing up in a close-knit family, anyone who has the courage to clearly see themselves and those they love, and tell about them. Knowing that the book dealt with the suicide of Kim Stafford's brother, I did not expect it to be so warm, lively and funny. But of course it is,because it is a story of Brett Stafford's life and his brother's life with him, and only later how the life ended. What a time they had growing up together, sleeping in twin beds,telling each other the same bedtime rhyme at night. When he tells how they each became a bridge between beds, I can feel their small, almost weightless bodies climbing across each other to the other bed. It's the sort of thing you know if you were lucky enough to grow up in a family with a sister close in age. I was that lucky and sometimes my sister and I slept in the same full-size bed and we always went through our nighttime ritual, "Good night...sleep tight...don't let the bedbugs bite...wake up feeling bright." I love the story of Brett sending away for the title book, "100 Tricks Every Boy Can Do," and daring to try the hardest one first. There are many such stories of the brothers as they grew up side by side. Stafford relates how they grew more separate as time went on, each developing their personalities in decidedly different ways. The closeness is still there and can be accessed if only they have the courage. There is sadness as Kim talks of how desperately he wishes he could have known, could have done something - anything to help his brother in that final torment. A death in the family is almost always fraught with equal measures of grief and guilt, and that guilt must be stronger with suicide. Still, I know how I looked back in time trying to find an answer that would have prevented my brother's death from cancer. I wanted to be his saviour and for a time actually believed I could have been. Kim portrays these feelings so purely that surely all of us find kinship in them. I will always be grateful to Kim Stafford for writing this book. All of his books are about humanity in general and specificly about people with whom he has exchanged an understanding, maybe even love. A few years ago I had the pleasure of reading his book about his father William Stafford. It is the life of a poet as well as the story of his own father and their family. Now Kim offers us the story of how his brother lived and ended his life and what it was like to grow up and become a man in the Stafford household. 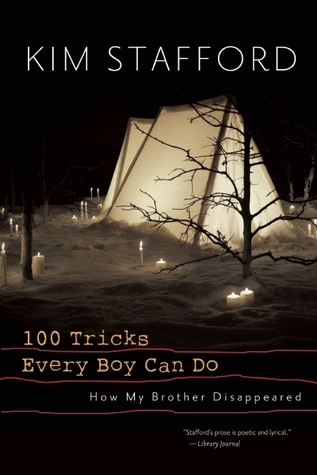 100 Tricks Every Boy Can Do by Kim Stafford is a memoir that touched me on many levels. A short book, it is easy to read because sections are one to five pages. describes seemingly random events and memories although the stated purpose of the book is to evoke discussion about Stafford’s older brother who committed suicide in 1988. In the Afterward, Stafford explains this approach, “I have my memory of him, my own life episodes that feel in keeping with his story, and what I am learning with my s 100 Tricks Every Boy Can Do by Kim Stafford is a memoir that touched me on many levels. A short book, it is easy to read because sections are one to five pages. describes seemingly random events and memories although the stated purpose of the book is to evoke discussion about Stafford’s older brother who committed suicide in 1988. In the Afterward, Stafford explains this approach, “I have my memory of him, my own life episodes that feel in keeping with his story, and what I am learning with my second wife, Perrin, and our son) 194). “I have tried to tell episodes from my brother’s life, from our father’s life, from my life, and from the life of my son in such a way that readers will be free to draw many of their own conclusions” (195). Comparing what he writes to the “dangle of life down low” in a forest, Stafford says, “So, too, in any life there is the understory, the narrative that begs from hiding for light, a glance, a voice. … I seek to honor the understory of my brother’s life” (196). “By studying my brother’s story, I learn that this life is not finally about how long one can be alive in the world, but how to be most alive while here” (197). Stafford concludes, “Give sorrow words. With words, stories spoken, the love, in fact, goes on. My brother kept silent in his pain—and broke. We must not do so” (197). One of Stafford’s conclusions particularly resonated with me. “As I pondered, I realized my psyche works like this: When I do something that does not pan out, that is something wrong, and something wrong is something bad, and when I do something bad, I am a bad person. As if by psychic voodoo, if someone near me gives me the silent treatment, I default to the explanation that they think I am bad, and so I am” (179). This is something I will take from the book to consider over time. Sometimes honesty can be breathtaking. Sometimes you want to read faster, to inhale all that there is, and yet you want to read slower, to absorb all that there is. I would set Luis Alberto Urrea's Wandering Time as a fitting companion for 100 Tricks, which is no coincidence. I was supposed to read this for class, and I feel bad, but I really just didn't care. At all. So I ended up not reading it. I really liked some parts and some parts were just okay. He has a gift for syntax and imagery. Some of the comments about memoir writing and the power of stories toward the end of the book are insightful, helping me (as a teacher) address some of the issues related to memoir writing. Here's one example: "The factual details of memory alone may be suspect, but the meanings they sift from the forgotten--these may be the gold we carry still when our treasure is gone." Read it cover to cover. Heartbreaking yet so full of life and love. An amazing testament to family and the heart. I appreciated the lovely language, the collage-like format (short sections and scenes, told out of time), and learning more about the remarkable Stafford family. It begins with a scene between Kim Stafford and his son talking about the suicide of Kim's brother Bret. Then we go back in time and learn about the events leading up to Bret's suicide. The section that follows introduces us to the two brothers, Kim and Bret, their similarities and differences, as they grow up, ge What a beautiful book. I appreciated the lovely language, the collage-like format (short sections and scenes, told out of time), and learning more about the remarkable Stafford family. It begins with a scene between Kim Stafford and his son talking about the suicide of Kim's brother Bret. Then we go back in time and learn about the events leading up to Bret's suicide. The section that follows introduces us to the two brothers, Kim and Bret, their similarities and differences, as they grow up, get married, and pursue careers (Kim following in the footsteps of his father, poet William Stafford, as a writing teacher and writer). William Stafford's advice for writers: Lower your standards and keep on writing. An assignment from William Stafford to his students: Think of something you did but write about something you might have done. Or think about something you said but write about what you might have said." An assignment from Kim Stafford to his writing students: What was your job in your family? That is, the task you figured out you had to do in the family drama. He reflects on the next life, how it is to know someone has gone before you, and mentions the story of Ishi, the last Indian of California and his ease once a group of anthropologists returned him to his homeland and he was able to contact his ancestors and know they were OK.
Kim Stafford writes: I believe his [Bret's] death began the next life for me, in this world. I live now in a realm where everything has changed, and the old ways of hiding begin to fall away." But the Afterword is the most profound, especially for writers of memoir. Poignant, evoked deep emotion in this reader. Stafford's prose lights the world. There were many pieces of this book that were significant to me personally. Finally, I solved the mystery of the other Stafford who used to work at Lewis and Clark. (Was she a Stafford? Yes she was!) I read an essay that covered the same topic as when I saw Kim do a "last lecture" at Lewis and Clark in approximately 1999. I got to read plenty of awe-inspiring excerpts about nature, and an essay that discussed the "resume of failures," a reminder to both recognize what you've lost in the attainment of something great and the dangers of comparing ourselves to others when we can't see beneath the surface. William Stafford, poet laureate of Oregon, and his wife had two sons and two daughters. The boys, Bret and Kim, were born only 14 months apart. As small boys, they did nearly everything together, told each other everything, and never fought. Each night, with their beds close together, the last thing each said softly to the other was: "Good night, God bless you, Have sweet dreams, See you tomorrow." In their early teens, some of their intimacy evaporated. They stopped telling each other everythin William Stafford, poet laureate of Oregon, and his wife had two sons and two daughters. The boys, Bret and Kim, were born only 14 months apart. As small boys, they did nearly everything together, told each other everything, and never fought. Each night, with their beds close together, the last thing each said softly to the other was: "Good night, God bless you, Have sweet dreams, See you tomorrow." In their early teens, some of their intimacy evaporated. They stopped telling each other everything. They stayed close, physically, through their college years. Bret got a master's degree and became a city planner. Kim did a lot of wandering and writing, and eventually became a teacher of writing. Both men married. Bret didn't like his job. One day he quit and announced he was taking his family to Canada, then did so. At 40, at his sister's house, he shot himself. I am glad I read this book. It is the story of the author’s relationship with his brother who committed suicide. The book, in my view, is too long. It is written well, but feels like it is edited poorly. There are many good things in here to mine. For my work I find this book helpful to think about paying attention to people and situations I might otherwise neglect. I appreciate the author’s honoring of his brother and not trying to resolve an unsolvable mystery. I really enjoyed this book. I actually had the pleasure of meeting and talking with Kim a week or so after I finished the book. I had been working on my own book and he gave me some great insights to how came about finally writing this book and telling the stories. It's just so pure and his writing is so easy to take in. I never found myself having to re-read passages and wonder what exactly he was saying or was meaning. It was there on the page and it was full of life and feeling. For Oregonians, the name Stafford holds a special place. William Stafford was poet laureate here and taught at Lewis and Clark College. In 1988, William Stafford's older son, Bret, committed suicide. Kim Stafford, Bret's younger brother, is also a poet and teaches at Lewis and Clark College. His memoir about his relationship with, and loss of, his brother is written in an easy flowing style. He has taken many years to gather himself to write this and his reflections are clear and touching. This one is interesting. It's told in little vignettes, a format I really like--I'm into lots of pieces cohering into a whole. At times, though, I wasn't sure about why which pieces went where. But ultimately, it's well-written, heartfelt, comes together, and made me cry and think about my own approach to life. I guess it wasn't at ALL moments as crazy astounding as I thought it might be when I started it, but it's pretty damn good. This author, in order to resolve his grief over his brother's suicide, told the story of life with his brother when they were young. I liked the author's style of writing but tired of the little vignettes. Just when I was about to put the book down, he tied it all together and I really enjoyed reading the conclusion. This is truly an honest moving and poignant book. I think it might be a useful book for anyone whose life has been touched by the suicide of a loved one. It was interesting on many levels to read about their life in Oregon. Not always an easy read but worthwhile and quite an achievement by the author. Kim Stafford is also a great speaker and well worth hearing live. This was a different style of book then I typically read. I think that the author was trying to grapple with his brothers suicide through writing about both the author and brothers lives. They are little pieces of memories. It was an interesting look into his memories of their lives. I especially loved reading about Oregon and their hiking and camping in the state where I live. An honest, soul-searching, heart-wrenching book that remembers the life of a beloved older brother and searches for peace and understanding 25 years after his death. The story lurches forward with only memories to sustain it, but finally finds a voice of acceptance. Thank you, Kim Stafford, for sharing your story. Stafford's brother committed suicide 25 years ago. In this memoir he attempts to come to grips with his relationship with his brother and his own story. Told in a series of vignettes he builds to a crescendo where we begin to see the entire picture. Stafford, like is his father, is a poet. His language is exact and these stories are both sweet and piercing. I always find it hard to rate a personal account of someone's life. How can a person say they did not enjoy it when you know you are going into it that it is something truthful and not embellished? The poet William Stafford had two sons, Kim and Bret. This memoir by Kim is mainly about the travails of Bret, who suffered an early death by suicide. An intimate and harrowing tale. Stafford's mosaic structure to his book puzzles together the story and impact of his brother's suicide. Stunning. I recommend this book to anyone whose life has been touched by suicide, depression, or loss of a loved one. A gorgeous look into memory of life and family.